HissTank › G.I. Joe Comics › PIT V1 Blueprints From Marvel’s GI Joe Comics! Hi all! Is there any interest in having/posting a set of blueprints for the original PIT as seen in Marvel #1 published in 1982? 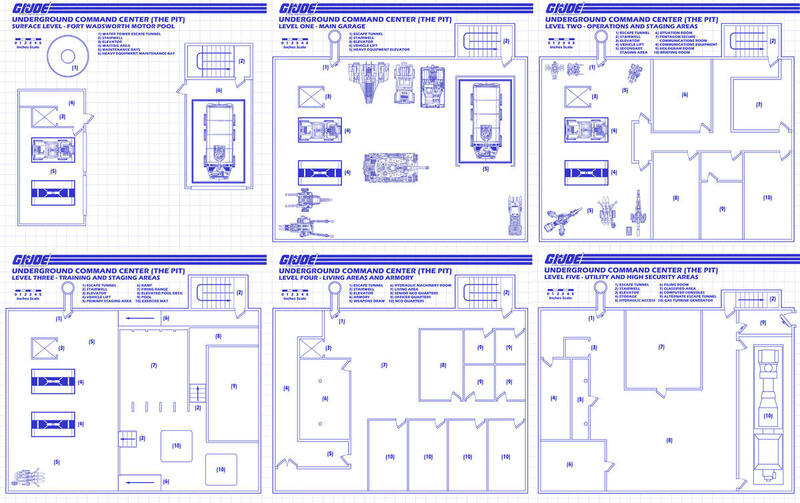 I have developed a set scaled for the 3-3/4" action figures, and laid each level out on sheets similar to the original Hasbro vehicle blueprints. I took a few liberties, since the Marvel artists didn't exactly draw in scale. 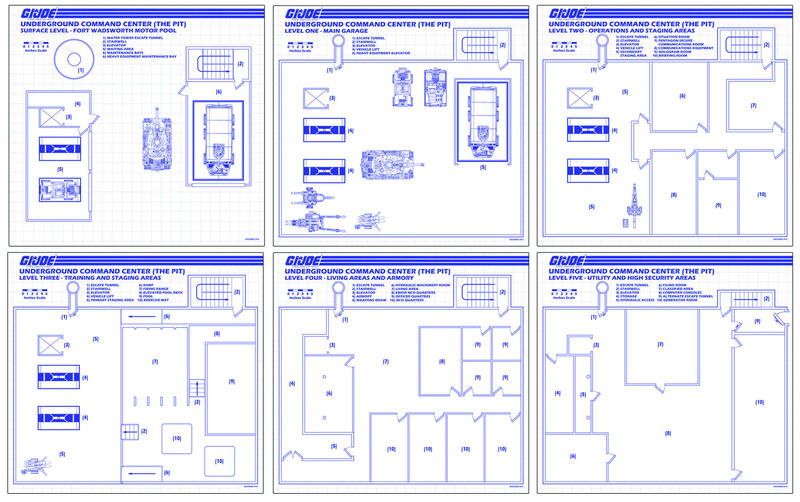 In theory, someone could use these blueprints to develop a reasonable scale diorama or print them to use as wall art. Here is a JPEG with all 6 levels on one sheet, sort of a collage of the individual blueprints. I welcome any feedback. Also, if anyone can suggest a good forum location to post the levels in higher resolution individual files? These are outstanding, by the way, I got them front paged! I've been in love with the idea of an epic PIT HQ since I was little. I actually took a plastic shelf and cut through it to make a hand operated "vehicle lift." This is exactly what I've been imagining for so long. Wow, fantastic and thanks for doing this! I have the opportunity to do my own toy room in a couple months and one of my plans is a set of shelving that will pull heavily from the Marvel PIT design for vehicle display. Damn Dude these are great!!! Since I bought my Quonset I have been planning to do a Pit style dio as the base it will sit on. I now not only do I have some inspiration I actually have a BP to follow. Great work. These are awesome! Did you draw the vehicles or import them from somewhere?